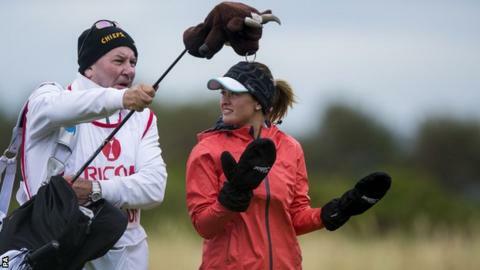 Welsh golfer Amy Boulden used all her links knowledge to produce a fine four-under-par 68 on day three of the Women's British Open at Turnberry. Battling both strong winds and driving rain, Boulden catapulted herself into contention to win her first Major. After a round containing five birdies and one bogey, Boulden is five shots off the lead. "You look at the leaderboard and the best players in the world are up there," said the 22-year-old. "It's nice to compete with them. I was quite calm out there today, just wanting to take one shot at a time. I wasn't nervous at all. "I tried not to look at the leaderboard - there is a long way to go - but I will try and do the same again tomorrow [Sunday]. South Korea's Jin Young Ko and Teresa Lu of Taiwan share a one-shot lead on eight-under-par, after both hit 69s on Saturday. Despite being only her second year on the Ladies European Tour, Boulden said before the event that she was not here to simply make up the numbers coming into Turnberry off the back of a tied eight finish in the Scottish Open. "This is my fifth major championship and I haven't made a cut, so it was nice to have made the weekend and go low to post a good round," she said after moving into 10th place, tied with Nicole Broch Larsen. Llandudno-based Boulden was coached by her father, Simon, growing up - a club professional at Maesdu Golf Club - but for the last three years has been under the guidance of European Tour professional Robert Rock. She won the Rookie of the Year award in 2014 as the best newcomer on the LET and plans to try and join the lucrative ranks of the professional circuit in the USA. Playing along side American world number six Lexi Thompson appeared to motivate Boulden, who held her own against one of the LPGA's leading stars. "Lexi is someone who I have watched over the last few years. She's an inspiration to young girls and was to me, so it was nice to play with her today," Boulden said. Boulden opened up her round with back-to-back birdies on the second and third holes, playing some excellent approach shots and taking her chances on the greens. A wonderful chip from 40 yards out led to another birdie on the par-five seventh hole, but it was her performance with the putter on the famous Ailsa course which delighted Boulden. "I three-putted the eighth but that's a tough hole and you would take four and run every time really," she added. "But after that [her only dropped shot of the round] I got a nice bit of confidence by picking up shots on 10 and 11." At that point Boulden had moved to four-under-par for her round and found herself being followed by the television cameras. Further opportunities to pick up shots came on 12 and 13 and, despite going into a deep-potted bunker in front of the 14th green, she played a beautiful sand-wedge save to keep her scorecard bogie-free on the back nine. There was another chance to pick up a shot on the 17th hole after an impressive wedge out of some rough grass, but her putt for birdie stopped just before the cup and she had to settle for par. Boulden's rise up the leaderboard means she will be in one of the final pairings on Sunday. "I don't really get nervous; I'm sure there will be some first tee nerves - as everyone gets in a Major championship - but I've got a good caddie on the bag and he'll keep me calm and patient," she added. "I'm hitting it very well. I like the greens here so you've just got to pick your lines." Boulden will tee of in group 33 at 13:05 BST on Sunday alongside So Yeon Ryu of South Korea, as she bids to become the first Welsh women to win a Major.